For many years, Projects Abroad has worked closely with orphanages and other residential care centres abroad to help provide better care and support to vulnerable children. Our volunteers have made a significant impact by improving living conditions at these orphanages. They have helped create opportunities for children through supporting their education and care. Over the past several years, our Childcare Projects have gradually shifted focus to community-based care. Our goal is to provide more support to local organisations that promote community- and family-based care, so children are raised in stable environments where they can thrive. Instead of working at orphanages or homes, our volunteers work in day care centres, kindergartens, and schools. Since January 2018, Project Abroad is working with expert support from ReThink Orphanages Network and others to make sure that we withdraw from orphanages and residential childcare slowly and carefully. This approach ensures that we cause no distress to the children and no harm to the institutions that care for them. At the same time, we are also expanding our community-based childcare programmes, building on successes in countries like Cambodia. We are using this model to grow community-based care initiatives in countries that are most affected by our move away from volunteering in orphanages abroad. This is a long-term commitment, drawing on the wide range of skills and expertise offered by Projects Abroad volunteers and staff, partner organisations, and ReThink Orphanages Network. Through community-based care, the reach of our programmes is greater, which means development is longer-term and sustainable. For example, we can now merge the efforts of projects like Childcare, Micro-finance, Public Health, and Nutrition to serve the community as a whole. This would include supporting parents and children on all sides through different projects. Childcare volunteers promote early childhood development for children during the day. Micro-finance volunteers then work with these parents to start sustainable businesses, while Public Health volunteers monitor their health and the health of their children, and Nutrition volunteers share knowledge about how to lead healthier lifestyles. Projects Abroad takes the safety of our volunteers and the children we work with very seriously. We have a clear Child Protection Policy in place that is strictly followed by all volunteers and staff. We also have Management Plans outlining the long-term goals we’re working towards in each of our Childcare placements. We have also invested in a secure and anonymous Global Impact Database, where we log and track the development of each child at our projects. In this way, we ensure each child is progressing and that future volunteers can continue where the previous volunteer left off. 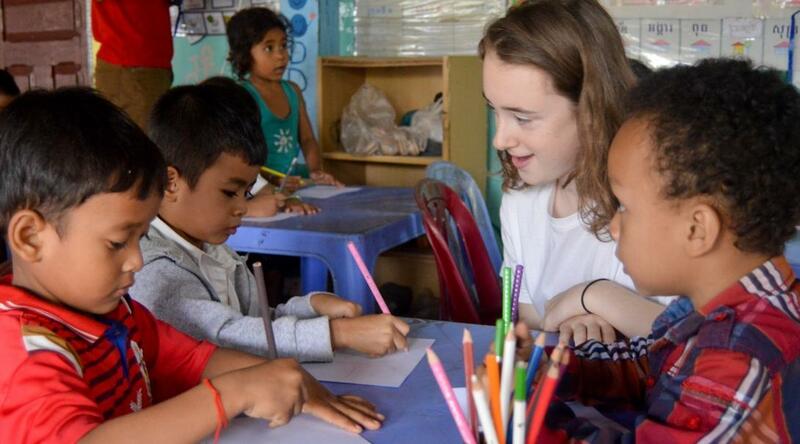 Interested in volunteering abroad with children? We have a wide range of Childcare Projects where volunteers can work with children in the developing world. Get in touch with us to learn more about how you can help and which project would be the best fit for you.